By Ken Blackwell, Contributing Author: Every fall, it seems, Americans are subjected to the ugly spectacle of Iran's Mahmoud Ahmadinejad coming to New York to address the UN General Assembly. There, at the podium, he is placed on a par with President Obama, Prime Minister David Cameron, France's Francois Hollande, and other leaders of civilized states. Ahmadinejad has used this podium to spew his anti-American, anti-Israel hatred. And yet he receives hearty applause from the Islamist delegates seated before him. Iran signed the UN's Universal Declaration of Human Rights as long ago as 1948. That's when Iran was ruled by the Shah. That UNDHR contains this provision, Article 18. Even though Iran is a signatory to this UN document, the mullahs' theocracy that rules in Tehran today flagrantly violates this article. Pastor Youcef Nadarkhani is in prison under sentence of death unless he recants his conversion to Christianity. A worldwide appeal has been made for Pastor Nadarkhani. Even the U.S. State Department--which under this administration has been extraordinarily lax in calling for the rights of Christians to be respected--has called for his release. Rev. Behnam Irani, a 41-year old Evangelical Christian, is also in prison. He's accused of endangering national security for holding Bible studies in his home. Pastor Irani has been beaten and tortured for his faith. There are reportedly many other Christians in Iranian prisons, threatened with death for no other reason than professing Christ. We are living in a time of Christian persecution unparalleled since the days of Hitler and the Soviet Gulag. And yet the UN remains in thrall to its Islamist bloc. To them, apparently, threatening their own people with death for conversion is perfectly normal, wholly acceptable. It's time to give teeth to the State Department warnings. The U.S. should demand the ouster of Iran from the UN. Iran is the world's leading sponsor of terrorism. Iran is defying the world body on the question of nuclear proliferation. It should not do this with impunity. Even if the U.S. cannot bring the UN General Assembly expel Iran's dictatorship by a majority vote, it would nonetheless put that majority on notice that our patience with murder cloaked in religious zeal is at an end. We should inform the UN that America's contribution to the world body's budget will be reduced so long as it harbors terrorists. Tough words are empty unless backed by strong actions. President Theodore Roosevelt did not have to cater to a world assembly filled with bloody despots. He quoted the African proverb: Speak softly, but carry a big stick. It's time for the big stick. And let's remember: T.R. won the Nobel Peace Prize for his strong and effective diplomacy. Ken Blackwell, former U.S. ambassador is to the U.N. Human Rights Commission, is a senior fellow at the Family Research Council. He is a contributing author to the ARRA News Service. Tags: Ken Blackwell, ambassador, UN, United Nations, Iran, sponsor of terror, persecuting Christian, dictatorship, human rights violations, nuclear proliferation, Boot Iran from UN, To share or post to your site, click on "Post Link". Please mention / link to the ARRA News Service. Thanks! Mr. Blackwell fails to address one key point here in his analysis, that being, the US should walk away from being a signatory to the UN's Declaration of Human Rights and the UN entirely. Why? Well lets examine the UN's list of lousy rights. There are only 30 Articles. I urge you to read them all--carefully. Words like compulsory and duty don't imply freedom, but rather, slavery. It reads like Orwell, who said, freedom is slavery. For starters, who is the UN to declare anything, or issue people rights? Where do they presume to get their assumed authority over the entire WORLD? Our rights come from God, they're inherent, we're born with them. If you don't believe in God and claim your birthright, then go ask the government what your rights are. They'll be more than happy to tell you what you can and can not do, when you can and can not do it, where you can and can not do it, even if, you can or can not do it. It is my understanding that no man is in authority over another man except through force or by consent--its just that simple. Each man must stand up and claim his right to be free, and never allow anyone else to re-present him, whereas you have forfeited all of your rights in doing so. So lets just read Article 30, the last article of the UN's crappy set of rights, something I wouldn't even dream of claiming or agreeing to. I'll claim with my God granted rights, they can keep their hu-man "rights." Just search the word "human" in the original 1611 KJV of the Bible. Guess how many times you find this word--zero. So if you don't like your crappy set of rights from the UN, then guess what, you're screwed, cause you have "no right" to tear it down, shred the whole kit and kabootle and start over with something else. It kinda closes the loop on the whole freedom thing doesn't it? Well, the devil they say, truly is, in the details. But this is the essence of collectivism, doing things for the whole, which ideally, has always sounded like a good idea at first, but in reality, results in a few men who tell the whole what they can do, how to do it, when they can do it, where they can do it, or, if they can do it at all. Sound like freedom to you? If your neighbor isn't free, then you're not free. If my neighbor isn't free, then I'm not free. Without freedom, you can't do anything--except what you're told to do. 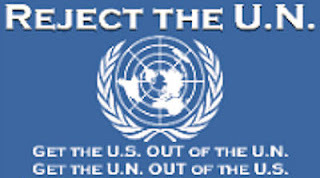 The US should withdraw from the UN, stop funding it, and evict them from American soil. They are the most corrupt organization in the world, except the Fed. US OUT OF THE UN!!!! Maybe just render Iran toothless and do this however it must be done.